Yesterday was annual shots day for several of the gang, including Hissy Fit Jones. As you would expect, it didn’t go well. Thank goodness that only happens once a year! 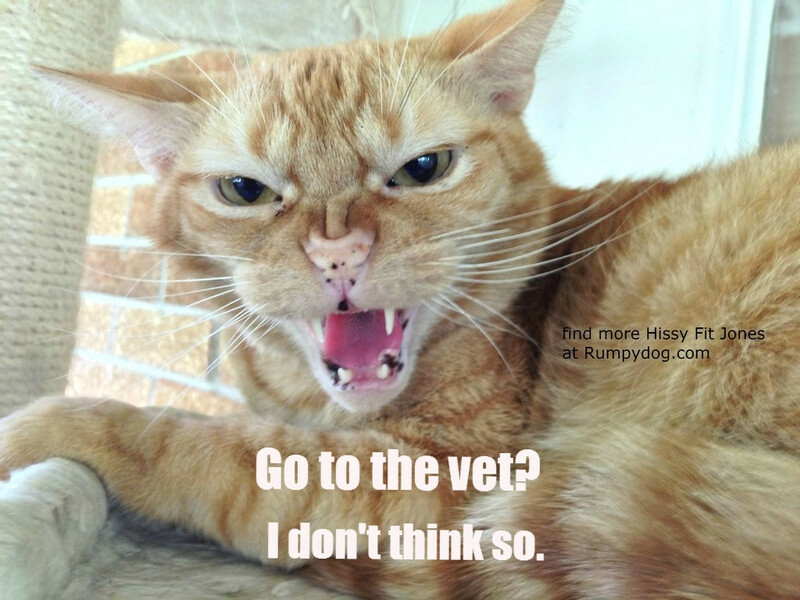 Oh boy… My cats don’t enjoy the vet either but it has to be done. Like you said – it’s only once a year! Though if it weren’t so stressful for the cat, it would be a great workout for me. Not a happy day in the Christmas Pie household either – although always surprised how quickly they rush back into their basket in the vets. Wish they were as keen when we are trying to get them in the basket ready for their appointment. Me too! I thought I was going to have to tear the bed down at one point to get Hissy. and, like it or not, we will wear the battle scars from getting them there! Yes! Now fingers crossed he doesn’t get sick and have to go back before next year’s shots are due. The part-time vet was there yesterday, not the regular one. He probably secretly prayed Jen would find another vet! I think the worst part is the serenade of misery I am subjected to on the drive to the vet’s office. My cats have a few tips for Hissy. Hissy, have you tried peeing on everyone? That can cause a commotion. One cat even pooped on my mother. Hazel crawled under the radiator in the vet’s office and wouldn’t come out. Next time we went, there was a grate nailed over the space. Jake used to glue himself inside the carrier so he didn’t even come out when it was turned upside down. Of course we have a new carrier for him so that can’t happen again. Glad it’s over for another year. Mine usually do pretty good once at the vet’s office, though, if given a chance, Bubba will crawl inside the storage cabinet. If they need lessons in bad behavior at the vet’s office, just let me know. We give group discounts. Ooh! good idea, Cupcake! We could sell Hissy face masks at Halloween! Been there, done that. Poor Jack. I need to drug him into a stupor to get him to even go inside the vet’s office. Thank goodness he is forgiving…. he did let me rub his ears and neck yesterday afternoon. Ah, remember Hissy was born to a feral mom, and while he has made great strides, he does still revert to his nature when stressed. Oh indeed he will..the fear factor and the change in routine is incredible for some cats..especially when they are from feral backgrounds…I know some very placid cats that come vet time become wildcats…and those claws and tetth and the strength is amazing…I still have some brutal scars from a feral..ripped my gloves to shreds…my fault I mis read his body language..eyes on the ball at all times! Our vet gives three year shots. BOL!!! No doubt! I don’t blame ya Hissy fit Jones!! The vet is no fun! Thank Ceiling Cat it is only once a year. Great expression! RC Cat shares your pain. Purring in solidarity!